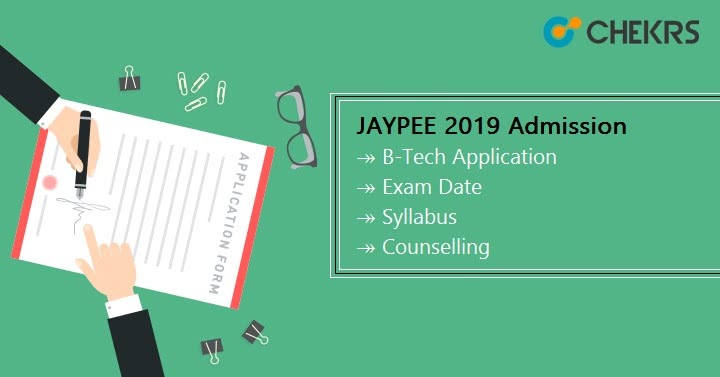 JAYPEE 2019 Admission: JAYPEE University was founded in 2001 by the JAYPEE group and started its operation in July 2019. JAYPEE University offers programs in Both UG i.e. Bachelor of Technology and PG i.e. Master of Technology. There are Dual Degree and Research Doctoral programs. UG programs offer Bachelor of Engineering in Biotechnology, Computer Science, Electronics and Communication, Information Technology, etc. JAYPEE has given admission on the bases of JEE Mains. Applicant should also qualify 10+2. Read the full article on detailed information for the JAYPEE Application Form and Other Events. There are some Eligibility criteria Candidates have to take care of. Candidates are advised to take a look at it, before filling the application form. All the candidates have to fill these eligibility criteria to appear in the exam. The Applicant must pass the qualifying exam i.e. 10+2 with Physics, Mathematics as compulsory subjects Diploma. Whereas one of the subjects like Chemistry, Computer Science, Biology, and Biotechnology as an optional subject. The Applicant must have scored minimum 60% of Aggregate in best of five subjects with 50% marks in each subject. If the applicant fails to pass in one subject he or she is not full filling JAYPEE Admission Eligibility Criteria. The Applicant should qualify the JEE Mains exam with minimum cut off required, and then the applicant is eligible to apply for the same. The candidate should give the proof of qualifying the exam otherwise the provisional seat allotment will be canceled by the JAYPEE Admission Committee, 2019. The applicant’s Date of Birth must be on or after 1 October 1998 to apply for the JAYPEE Admission Eligibility Criteria. The candidate not older than 22 years for the programs. Applicant first choose which method is he/ She looking for Applying the form, The form can be filled both online and offline, the applicant can see according to their convenience. For Offline Applicant can buy the form from any campus near to them for Rs1200, so in offline mode, you pay directly. For the online mode, Applicant goes on the http://www.jiit.ac.in/ and click on the application link and start filling the form. The Details which you have to fill in the offline and online paper are same. Fill your Personal details like Name, Father Name, Mother Name, Address, and Email-ID. It is mandatory to fill your JEE Mains Registration Number in the form for future Reference. Then you have to fill the education details like School Name, your stream, etc. Then upload your documents like mark sheet, passing certificate, recent passport size photograph with specific dimensions, signature etc. For offline you have to paste the photo and sign your signatures. Once you fill up all the details cross verify it again in both offline and online mode. Then submit the JAYPEE Registration Form in the online mode and it will redirect to the payment mode. Payment can be done in online and offline both. In case of the online mode, you can pay through Net Banking/Credit Card/ Debit Card or through Demand Draft in the name of JAYPEE Institutes Admission Account payable at Noida/ New Delhi. Once you fill the form don’t forget to take print out in online mode whereas in case of the offline form keep a photocopy of the form before submitting to the University for the future references. The application form can fill via. Online and offline mode. The JAYPEE Application Fee for the form is Rs 1200. The fees paid through DD (Demanded Draft) and will have the extra bank charges with Rs 1200/-. The counseling will be of a two-day process for all the campuses, it will be scheduled on the first week of July 2019. Candidates are required to read all the instruction before coming to JAYPEE Admission Counseling. It includes every document required to carry, the payment (if you are selected), etc. Candidates have to bring verify all their documents and certificates. The confirmation of Admission is given only after verifying the JEE Mains Exam Score Card and All India Rank (AIR). JAYPEE Spot Counseling is also scheduled for the second week of July if the seats remain vacant after the main counseling. The result will be announced after the all the rounds of counseling 2019. Once the JAYPEE University Result is announced, the provisional seat allotment letter is issued to the successful candidates. Candidates have to keep it safe because you will need it in the admission procedure. The confirmation of JAYPEE Admission is given only after verifying the JEE Mains Exam Score Card, All India Rank (AIR), and all the documents. The cut off will be different for different branches as per the availability of seats. The Candidate should also pass the JEE Mains cut off. On the basis of the candidate’s rank, category, reservation, Seat availability, and their choice, candidates will get admission in the preferred course and institute. So start your preparation from today and clear the JEE Main Exam, So you get admission through JAYPEE 2019.